One of my favorite aspects of being a Jane Austen fan is the number of prequels, sequels, and deviations her work has inspired. It means that no matter which of her novels I pick up there is sure to be another book to dive into should I wish to remain in the world of that novel. After devouring Jane Austen’s Persuasion I definitely wanted to wallow a bit more. This led me to pick up My Dear Sophy by Kimberly Truesdale. As you may surmise from the title, it is not a story about Anne and Captain Wentworth, but rather a story about Wentworth’s sister, Sophia and Admiral Croft (Captain at the time). The story takes place in the Wentworth’s home town of Melverton. The Wentworth family consists of Mr. Wentworth, the town doctor, and his children Sophia, Edward, and Frederick–their mother having passed away a few years before. Life is fairly idyllic for Sophy as she cares for her father’s home and mothers her younger brothers. She is well-liked in town and even has an admirer. Sophy leads what she would call a “quite circumscribed” life, one of “comforting monotony.” But with the arrival of Captain Croft–returning to visit his parents after 14 years abroad–Sophy begins to think of life beyond, of adventure. I thoroughly enjoyed this story about how the Crofts came to be. In all of Austen’s novels I find it quite interesting that in Persuasion those couples that seem to have the best relationships are the naval couples, namely the Crofts and the Harvilles. Their manners are also more relaxed and their hospitality genuine in a way that Austen doesn’t portray many couples we would call happily married. Given the strength of the Croft’s relationship in Persuasion it was very satisfying to see how Truesdale envisioned their beginnings. In reading My Dear Sophy one of the lines Sophy speaks to Croft struck me, and has stayed with me. While talking of dreams and life beyond Melverton she says to him, “But we none of us expect to be in smooth waters all our days.” It is one of those lines that embodies the character of a person. And this line speaks to Sophy’s. She is a strong woman who faces what life presents her. She doesn’t shy away from the difficulties. She’s the kind of woman I would love to sit down to tea with and listen to. On a side note I just have to say that the cover image of this book is by far one of my favorites. 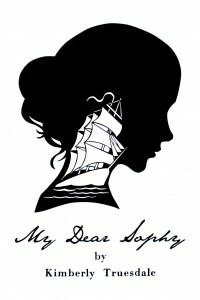 Enter for a chance to win a copy of My Dear Sophy by Kimberly Truesdale for Kindle courtesy of the author. Giveaway open internationally, and be sure to check back with us on Wednesday when Truesdale stops by to talk more about this wonderful story.